Baseball is a sport played by two teams, each team has nine players. In baseball, one team throws a small round ball called a baseball and the other team tries to hit it with a club called a bat. Teams score points by running and touching markers on the ground called bases, until they reach the last one called home plate. Baseball started in United States in the 1700s and 1800s, but historians are not sure who invented it. Many people in North America, South America, and East Asia play baseball. 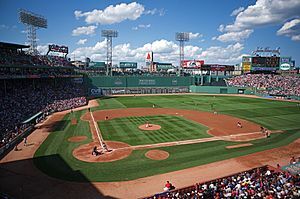 In the United States, baseball is called the national pastime, because so many people in the United States used to spend a lot of time playing or watching baseball games. Today, though, most Americans follow football more than baseball, especially when it comes time for the Super Bowl. The earliest known reference to baseball is in a 1744 British publication, A Little Pretty Pocket-Book, by John Newbery. It contains a rhymed description of "base-ball" and a woodcut that shows a field set-up somewhat similar to the modern game—though in a triangular rather than diamond configuration, and with posts instead of ground-level bases. David Block discovered that the first recorded game of "Bass-Ball" took place in 1749 in Surrey, and featured the Prince of Wales as a player. William Bray, an English lawyer, recorded a game of baseball on Easter Monday 1755 in Guildford, Surrey. This early form of the game was apparently brought to Canada by English immigrants. Rounders was also brought to the United States by Canadians of both British and Irish ancestry. The first known American reference to baseball appears in a 1791 Pittsfield, Massachusetts town bylaw prohibiting the playing of the game near the town's new meeting house. 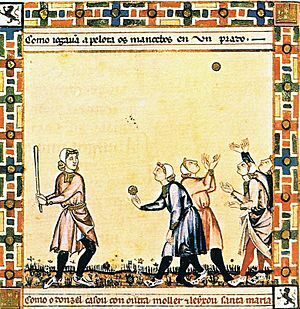 By 1796, a version of the game was well-known enough to earn a mention in a German scholar's book on popular pastimes. As described by Johann Gutsmuths, "englische Base-ball" involved a contest between two teams, in which "the batter has three attempts to hit the ball while at the home plate." Only one out was required to retire a side. 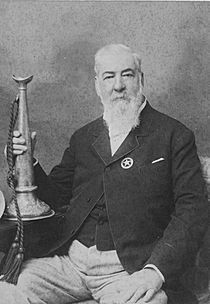 In 1845, Alexander Cartwright, a member of New York City's Knickerbocker Club, led the codification of the so-called Knickerbocker Rules. The practice, common to bat-and-ball games of the day, of "soaking" or "plugging"—effecting a putout by hitting a runner with a thrown ball—was barred. The rules thus facilitated the use of a smaller, harder ball than had been common. Several other rules also brought the Knickerbockers' game close to the modern one, though a ball caught on the first bounce was, again, an out and only underhand pitching was allowed. While there are reports that the New York Knickerbockers played games in 1845, the contest long recognized as the first officially recorded baseball game in U.S. history took place on June 19, 1846 in Hoboken, New Jersey: the "New York Nine" defeated the Knickerbockers, 23–1, in four innings. With the Knickerbocker code as the basis, the rules of modern baseball continued to evolve over the next half-century. On a baseball field, there are four bases. The bases form a diamond that goes around the field to the right from the starting base. The starting base is called home plate. Home plate is a pentagon, which is a shape that has five sides. First base is on the right side of the field, second base is at the top of the infield, third base is on the left side of the field, and home plate is at the back of the field, where the catcher plays. 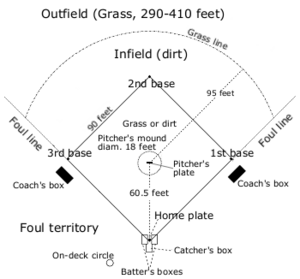 The baseball field, or diamond, has two main parts, the infield and the outfield. The infield is where the four bases are. The outfield is beyond the bases, from the view of home plate. The lines from home plate to first base and home plate to third base are the foul lines, and the ground outside of these lines is called foul territory. A ball that is hit with a bat and flies between the foul lines is a fair ball, and the batter and runners can try and run around the bases and score. A ball that is outside the foul lines is a foul ball. 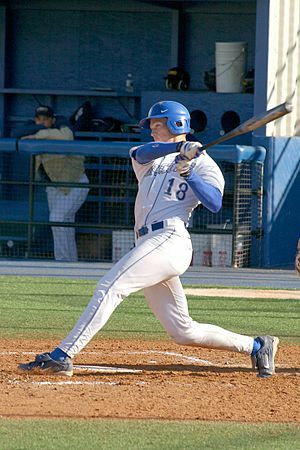 If the ball hits the ground in the foul area rather than being caught in the air, the batter continues to bat, and any runners must return to the base that they were on before the ball was hit. If the batter has fewer than two strikes, a foul ball counts as a strike. If the batter already has two strikes, and the foul ball is not caught in the air, then the batter continues to hit. If a ball is caught by a fielder in fair or foul ground, the batter is out. The most important part of the game is between the pitcher and the batter. The pitcher throws, or pitches, the ball towards home plate. The pitcher normally throws the ball close enough for the batter to hit it. If the pitcher throws the ball in the strike zone, which is the area over home plate and between the hitter's knee and chest, the pitch is a "strike", unless the batter hits the ball. The pitch is always a strike, regardless of where it is, if the batter swings the bat and misses, so the batter must have good aim with the bat. Three strikes are a "strikeout", and this is one way to make an "out". A pitch that the batter does not swing at, and which is not called a strike, is a "ball." On the fourth "ball" thrown by a pitcher, the batter "walks" to first base, so it is important to pitch well. The team on the field tries not to let the team who's batting get any runs. The fielding team has a pitcher and a catcher. The remaining seven fielders can stand anywhere in the field. However, there are usually four people that stand around the infield close to the bases and three outfielders who stand around the outfield. Teams can change pitchers during a game. Teams change their pitchers often because it is hard for a pitcher to throw a full game of nine innings. A pitcher can sometimes throw a no-hitter where no one on the opposite team gets an earned hit. A team can use as many pitchers as it wants to, but it is rare to use more than eight in a game. The ways that a pitcher throws the ball are called pitches. Many professional pitchers use two or more different pitches. Pitchers change which pitch they throw so that the batter will be tricked and not know what pitch to expect. This makes it more difficult for the batter to hit the ball. Pitchers can make the ball move differently: faster or slower, closer or farther from the batter, higher or lower. There are also many types of pitches, such as the slurve, curve, slider, splitter, sinker, screw, 2-seam cut, 2-seam screw, knuckle, knuckle curve, change-up, circle change-up, palm ball, and others. When throwing the ball, the pitcher must touch the pitcher's rubber with his foot. The pitcher's rubber is on top of the mound. The pitcher cannot take more than one step forward when he throws the ball. That makes the pitcher throw the ball slower. Many major-league pitchers can throw the ball up to 100 miles per hour (145 km/h). Throwing a baseball that fast can be bad for the body. Pitchers can end up with a lot of injuries. Doctors often will perform Tommy John surgery on a pitcher with an elbow injury. The operation is named after Tommy John, the first pitcher to have the surgery. Today, pitchers are able to recover from their injuries much more often than before Tommy John surgery. Bunt: when the batter holds his bat out to try and hit the ball rather than swinging it. A bunted ball does not go far usually. Pitchers often bunt because they are not as good at hitting. 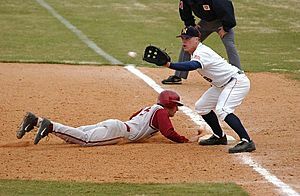 A bunt is also often used when trying to advance another runner already on one of the bases. This is called a "sacrifice" or "sacrifice bunt." Hit: When the batter connect an unstoppable. Home Run: When the batter hits the ball outside the baseball field, he gets to run all of the bases and scores at home plate. Baseball Facts for Kids. Kiddle Encyclopedia.